My friend sent me over a $10 credit to use with sprig.com. Sprig delivers ready-made meals from its two kitchens—one in San Francisco, the other in Palo Alto—to area users in 15 to 20 minutes. Diners can choose from three daily options at lunch and dinner, and brunch on the weekend. Customers can purchase dinner all-in for less than $15 on average. The company uses dynamic pricing, like Uber and Lyft, for delivery, with the average fee clocking in at around $2.75. 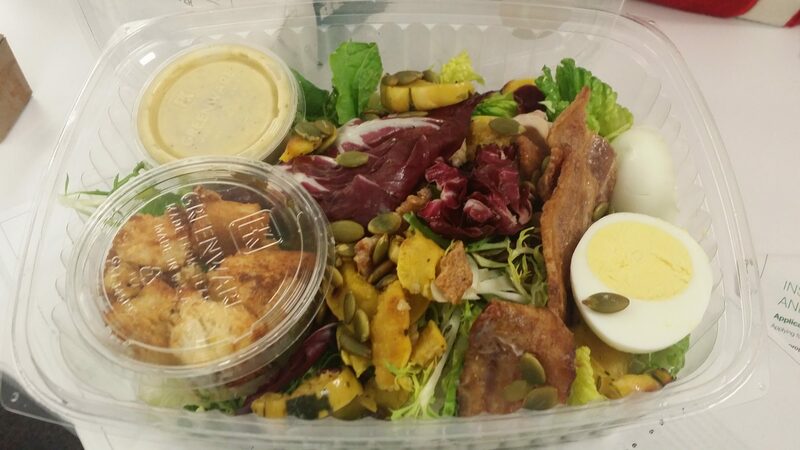 I took a stab at trying it out and saw a Autumn Lyonnaise Salad with Hard Boiled Egg. I setup my account, clicked to order, and in 7 minutes, I’m eating this salad. It was super fast. I was so excited that I started eating it all up. Overall, it’s a great salad for a good price. Especially if I didn’t have to step outside to walk too far. I guess the organic/healthy side of it makes up for the lack of walking. The only thing I had a problem was the bacon. Many of you know I love bacon. The menu listing said ‘crisp bacon’ and what I received was soggy bacon. Not soggy from fat bacon but moist from being mixed with salad leaves.